Will Our Kids Have to Go to School on Labor Day? Where Does It End? Senate Republicans argued their support for Governor Larry Hogan’s Executive Order stating that public schools start after Labor Day. Senate Bill 128 would override Governor Hogan’s Executive Order and initiated a heated floor debate between both sides of the aisle. Not only did the Democrats vote to pass the bill on second reader, but they also voted to defeat several Republican proposed amendments. Senator Steve Hershey’s (R-36, Upper Shore) very reasonable final amendment to make Labor Day an official school holiday was laid over until tomorrow, but is still facing strong partisan opposition. This legislation makes no mention of Labor Day as an officially recognized school holiday. 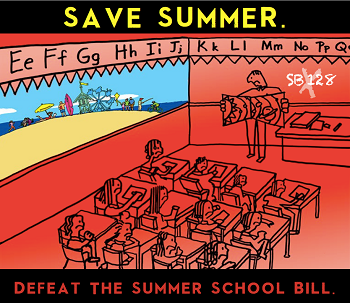 This oversight in the bill language could leave the door open for school boards to determine that not only must their schools start before Labor Day, but also that students could be forced to attend school on that day as well. Senator Hershey also offered an amendment attempting to provide start and finish parameters on school scheduling. The amendment proposed that schools must start after August 15th and must end before June 15th while providing an automatic five day extension if requested.